I’m back today with my first installment of our renovation progress, which I’ll be doing week to week until this project is finito!! The renovation is primarily about the kitchen, but we’re tackling our floors at the same time so our foyer is going to get a big upgrade as well – AND since one of the dining room walls is affected, I figured I might as well go ahead and implement some plans I had for that room too! So yes, it’s a little nuts around here if you’re wondering! 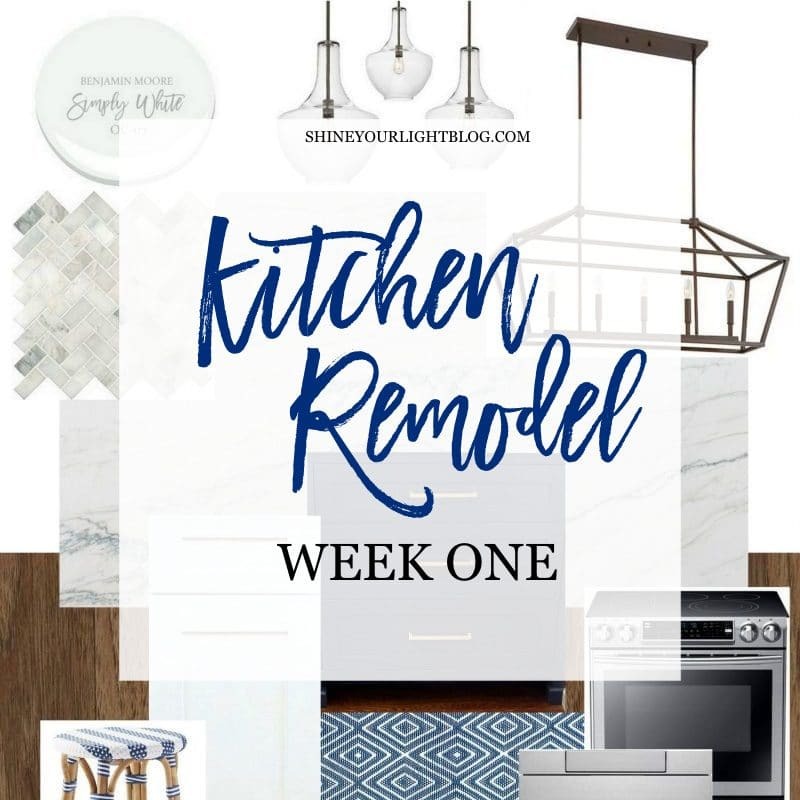 These weekly updates will focus mostly on the kitchen and flooring progress and I’ll bring you up to speed on the dining room changes eventually too. Renovating a kitchen in the midst of an unpredictable New England winter is definitely a bit of a gamble. 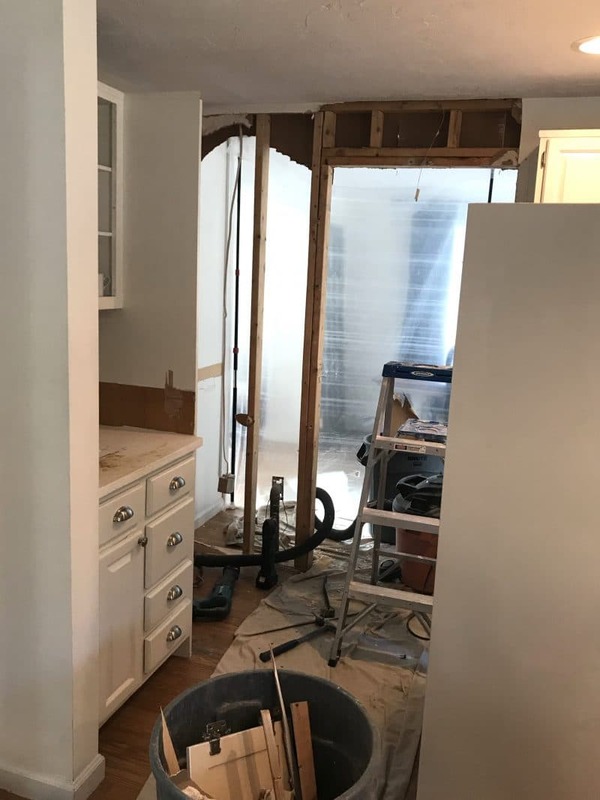 With some good behavior from Mother Nature, our cabinetry will be arriving the last week of February – that’s really the big item that dictates the timeline for the whole renovation. Right now our plan for this whole production is something along these lines…. *the work we’re outsourcing to contractors, phew!! Here’s what happened this week!! 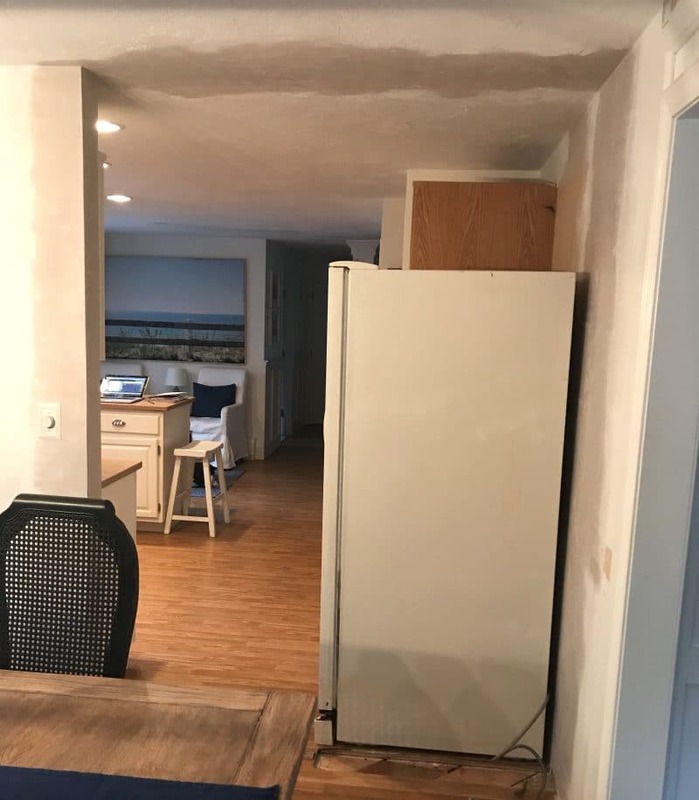 Our contractor removed half the wall from the kitchen into the dining room, which required rerouting an outlet, capping a central vacuum receptacle and patching the subfloor where the receptacle came through, and then plastering the new opening and ceiling. and from the kitchen into the dining room as the wall is coming down. Opening up this wall lets in more natural light to the kitchen and makes these rooms feel so much more connected, especially nice since we use our dining room for all our meals. 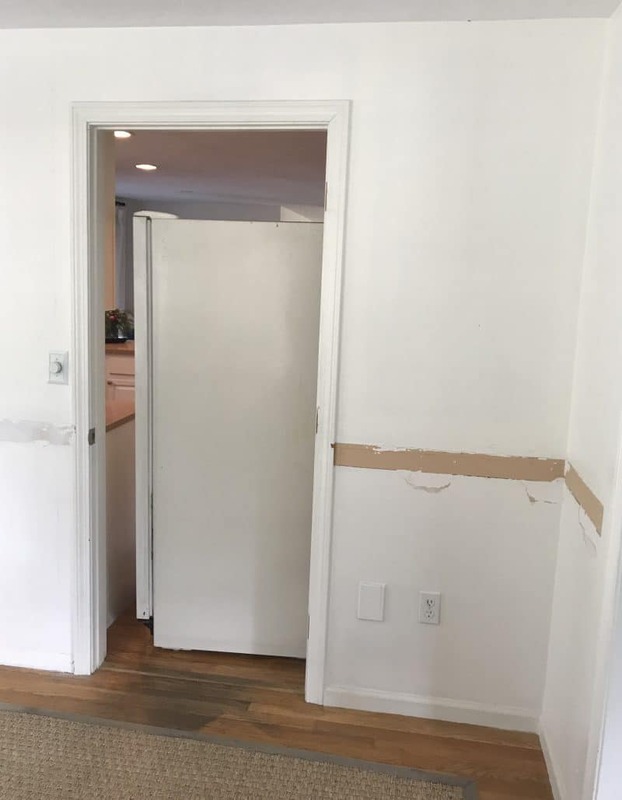 The new fridge and cabinet will switch places so that the fridge is no longer opening into the doorway of the dining room – something that has driven me bonkers for 8 years! – and that the cabinetry and countertop will be more accessible for the dining room. We gained a bit of space with the wall coming down so the cabinet and countertop will also be a little longer than our existing 24″ cabinet. This might not look very pretty yet but it’s oh so exciting to get the ball rolling!!!!! 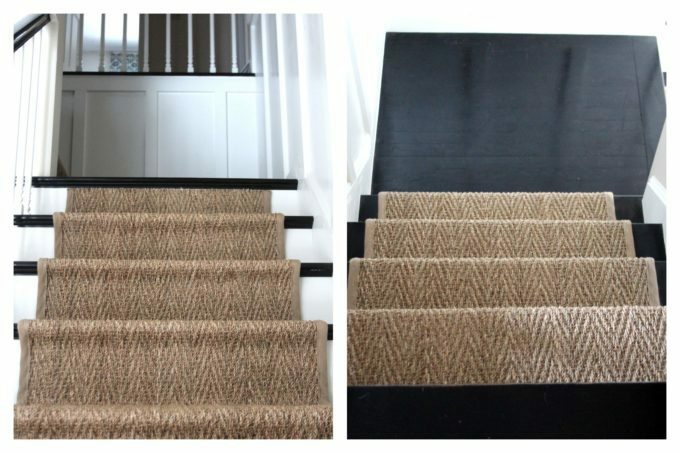 Onto the flooring……years ago I stained our foyer stairs dark and even though I have loved this look with the contrast of the seagrass runner, keeping up with dark floors was definitely a challenge for me!! I even wrote a post about how it was one of my renovating regrets! 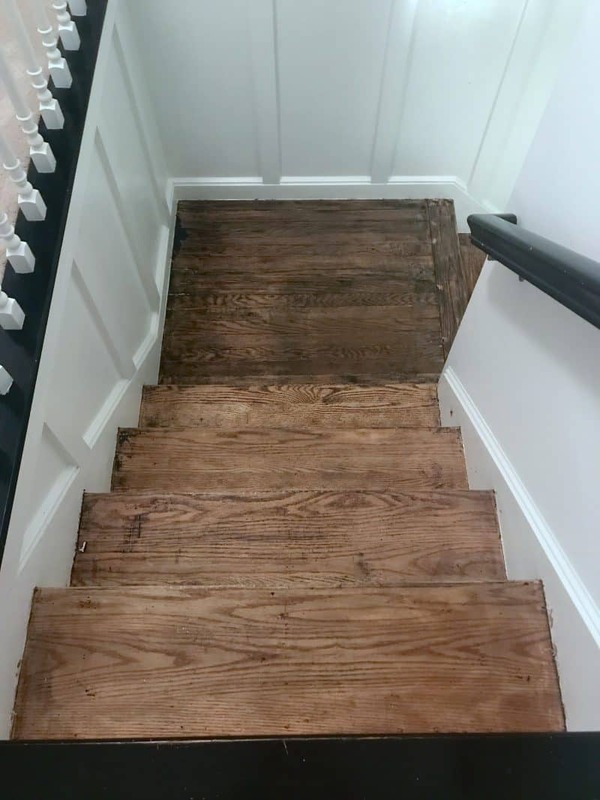 Now that the kitchen vinyl and foyer tile will be replaced with unfinished white oak to match the adjacent dining, living and family rooms, and everything will be stained a lighter color, it was time to address the stairs again. UGH! 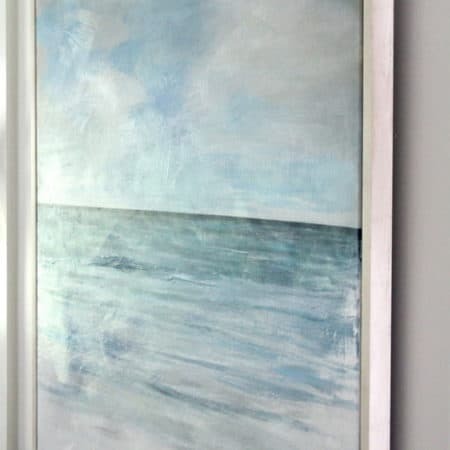 As much as I have disliked how the dark treads show every speck of dust, this is ONE area of our house that is done and it pained me a little to rip off the seagrass and start again!!!! This is a laborious job and I still have a ways to go, but I must admit that I’m already loving the warmth of the wood tone and am looking forward to my new vision for these stairs!!! I’ve redone about 6 sets of stairs and removed more carpet than I care to recall, and have learned a few tricks along the way, so if this is something you’re thinking of tackling, keep an eye out for a how-to post when I’m done with these. I’m still working on the stairs and removing the foyer tile, searching for the perfect doors for our pantry, and looking at countertop materials which is seriously a dream come true for me!! I’ll report back on my progress next week and hope you enjoy seeing the transformation of this kitchen in the next few months. Thank you for your kind comments and your enthusiasm for this project, I truly have the best readers in the world! I’m excited to follow your progress too Cassie! Lisa I wish you the best with the renovations. Thanks for keeping us updated, it’s exciting to see the changes! Thanks Jack! I’ll be expecting you soon to christen this space with us! Wow, Lisa, you have a ton of work ahead of you – it will be amazing when it’s all done, though – looking forward to following the progress!! It is a huge undertaking but we’re excited about it Debbie! So exciting! Looks like you’ve got a lot done, with a lot more to go. Such a fun, exciting project!! Thanks so much Emily! We’re so ready to get going with this! I can hear and feel your excitement about this renovation, Lisa! 🙂 Can’t wait to see it all come together… It’s going to be so beautiful! Thanks so much Carol – we are really looking forward to these long-awaited changes!